Get a $5 Gift Card in Every Kit! In fact, we put this gift card in every individual kit box shipped. For example, our 5 plate ELISA kit comes with a separate box for each plate - That's $25 in gift cards for one order! 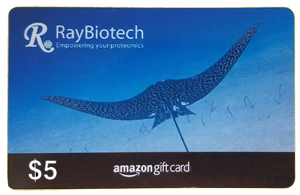 The $5 gift cards can only be found in kitted products, such as our ELISAs and Arrays. Order today to get one step closer to buying that sweet poster of Justin Bieber! $5 Not Enough? Then Review Our Products. We invite you to submit a review for any product you have purchased and tested. 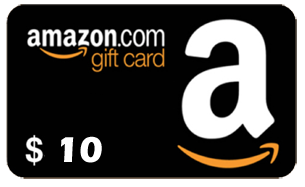 All verified reviewers will receive a $10 Amazon gift card. Have you tested multiple products of ours in the past? Great! More reviews = More money. Reviewing our products is easy. 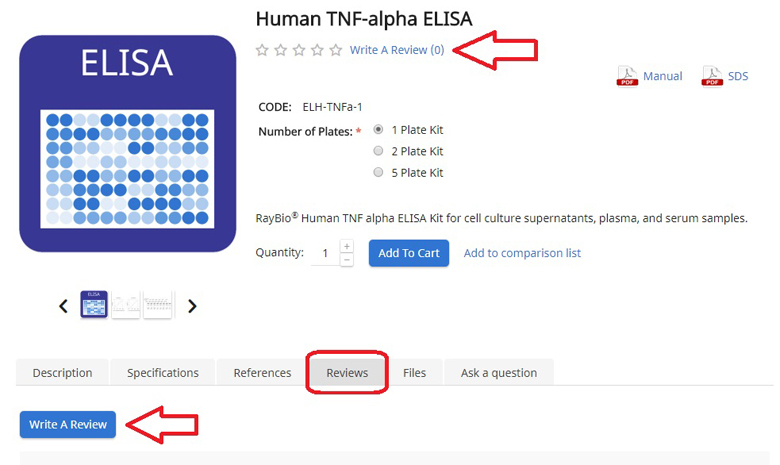 Simply find the website listing for the research product you tested and click one of the links shown in the image below.